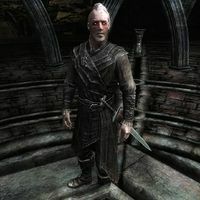 Lokil is a Nord vampire found in Dimhollow Crypt, particularly in the Dimhollow Cavern section which is inaccessible before Awakening. He will be interrogating Vigilant Adalvald about how to release the artifact sealed within Dimhollow. After failing to extract information from him, Lokil will kill him. He will immediately become hostile on detection. Lokil's appearance and equipment are randomly generated to that of a Master Vampire. However, his voice always remains the same. Vampire 1: "I wish Lokil would hurry it up. I have half a mind to return to the castle and tell Harkon what a fool he's entrusted this mission to." Vampire 2: "And I have half a mind to tell Lokil of your disloyalty." "So go and meet your beloved Stendarr." Adalvald: "I'll never tell you anything, vampire. My oath to Stendarr is stronger than any suffering you can inflict on me." Lokil: "I believe you, Vigilant. And I don't think you even know what you've found here." Lokil: "So go and meet your beloved Stendarr." Vampire: "Are you sure that was wise, Lokil? He still might have told us something." Vampire: "We haven't gotten anywhere ourselves with..."
Lokil: "He knew nothing. He served his purpose by leading us to this place. Now it is up to us to bring Harkon the prize. And we will not return without it. Vingalmo and Orthjolf will make way for me after this." Vampire: "Yes, of course Lokil. Do not forget who brought you news of the Vigilants' discovery." Lokil: "I never forget who my friends are. Or my enemies." At this point, Lokil will be walking around the stone structure, inspecting it closely to look for clues on how to get the artifact. He must be killed in order to progress, as he will automatically detect you when you activate the button in the middle of the structure. If you reanimate him, he will also attack you in that state when you trigger the button. This page was last modified on 17 April 2017, at 02:00.